Lock in a great price for Chachagua Rainforest Ecolodge – rated 9 by recent guests! Grounds were beautiful and dining area was wonderful with marvelous staff. Pool had new patio and was clean but lining needs to be updated. The rooms were very outdated, dark (not enough light), woodwork was not maintained, old/yucky mattresses, opening in doors allowed many bugs and ants into room. The surroundings were beautiful. Staff very friendly. Menu could have had more variety. A great stay overall. Place is amazing, in the middle lf the rainforest! Comfortable, hughe and very nice room. Staff very friendly and always willing to attend your needs. I made a mistake when I did the reservation and asked for a change of dates. Despite they have all rooms of category that I have booked completed, they give me an upgrade for free to help me! I surely will come back! Loved the total experience, especially the rainforest atmosphere and the wild birds and animals - Toucans and Howler Monkeys. The staff were very friendly and made us feel so welcome. It's in the rainforest! Great staff, especially Carolina and Diego and Felix - but everyone would do absolutely anything to make your stay enjoyable. I was a single lady, traveling in the jungle. The care and warmth of staff was exceptional. The adventures were glorious. The drivers were the coolest! This is a perfect family vacation or perfect solo escape. Pura Vida, baby! Loved the grounds, and the trails. The staff at the restaurant were so friendly. Loved our bungalow. 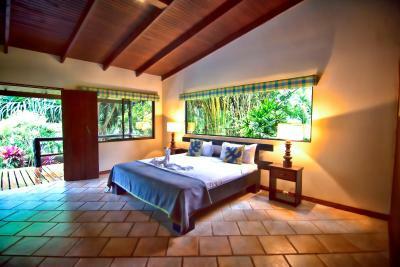 It is a very big property in a rain forest with great hikes. 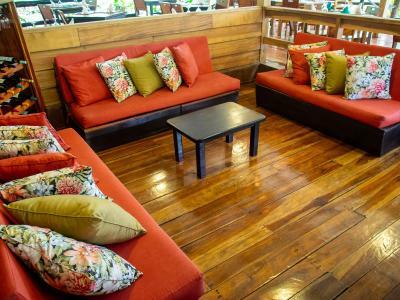 Chachagua Rainforest Ecolodge This rating is a reflection of how the property compares to the industry standard when it comes to price, facilities and services available. It's based on a self-evaluation by the property. Use this rating to help choose your stay! 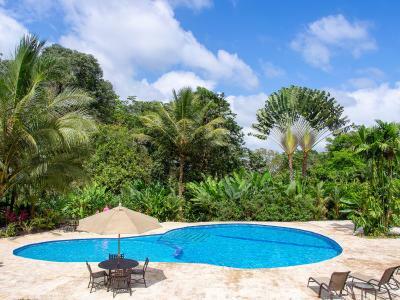 One of our top picks in Fortuna.Surrounded by 300 acres of lush rainforest, Chachagua Rainforest Hotel offers charming accommodations and an outdoor swimming pool. This resort has a beautiful setting outside Chachagua and 9.3 mi from Arenal Volcano, and La Fortuna. 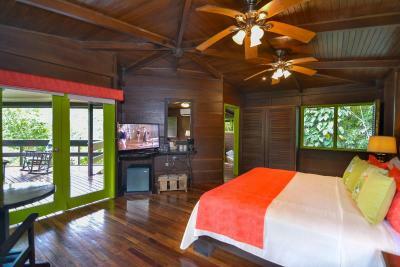 Each spacious room and bungalow at Chachagua Rainforest Hotel has bright, attractive décor. There is free Wi-Fi and views of the surrounding trees and plants. 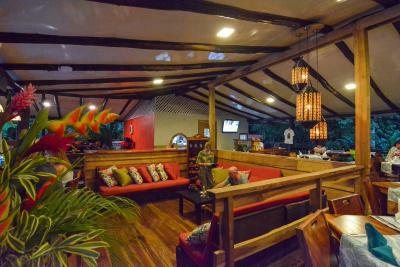 Guests can enjoy Costa Rican cuisine prepared with organic produce, grown in the Chachagua’s grounds. Monkeys, sloths, parrots and other wildlife can be observed in the surrounding rainforest. There are several walking trails leading to waterfalls, streams and ponds. Set in Costa Rica’s Central Valley, the hotel has easy access to the Tilaran mountains and the Children’s International Rainforest. San José and the Gulf of Nicoya coastline can be reached in 90 minutes by car. This property is also rated for the best value in Fortuna! Guests are getting more for their money when compared to other properties in this city. When would you like to stay at Chachagua Rainforest Ecolodge? 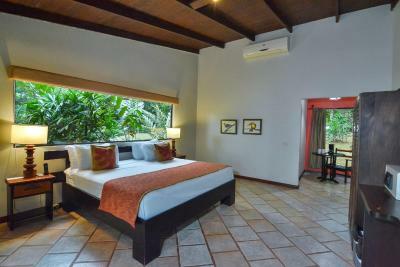 This bright room has attractive décor and overlooks the surrounding rainforest and the hotel pool. There is air conditioning, free Wi-Fi and a private bathroom. Featuring a large deck with a hammock and rocking chairs, this bungalow has views of the surrounding rain forest. It has a sitting area, a fan and a private bathroom. 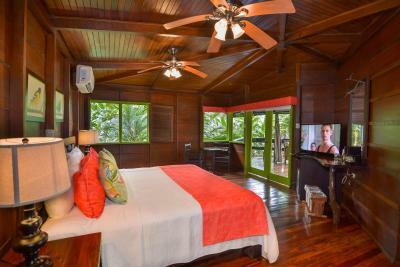 Featuring a terrace with views of the surrounding rainforest, this bungalow has a hot tub, a minibar and satellite TV. There is a sitting area, a fan and a private bathroom. Please note that children cannot be accommodated in this bungalow. 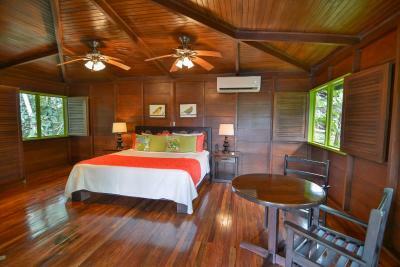 This bungalow features a mini-bar, air conditioning and private entrance. House Rules Chachagua Rainforest Ecolodge takes special requests – add in the next step! Chachagua Rainforest Ecolodge accepts these cards and reserves the right to temporarily hold an amount prior to arrival. Initial problem with rats in the room of my sister. VERY unfortunate. We realize we ARE living in the jungle and these things happen. However, the response was not terribly empathetic. We had to fight for some compensation. Atmosphere, luxury Indiana jones feeling. Location room decoration of the whole park. Excellent swimming pool with hot tub. Bungalow and rooms were actually if you participate in a juraasic parc jungle . Wow!! Free walking tour was nice as well as the restaurant and an excellent breakfast. Staff very friendly. Pura vida!! Staff was amazing, the grounds are spectacular, the accommodations are very nice, and the food is good. The property is very secluded and there is little to no help with transportation, shuttles and activities. Minimum amenities. Excellent location not to close to La Fortuna but an easy 20 or so minutes away by car. 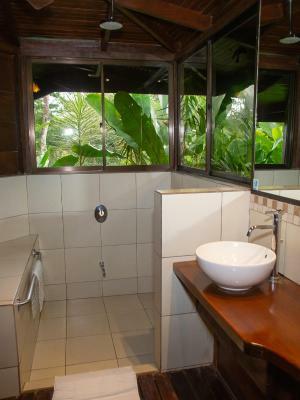 We had a room with a rainforest platform, stunningly decorated with a beautiful bathroom. Staff where friendly and efficient. Jenny in the restaurant was particularly welcoming, Thank you for making us feel so welcome Jenny! Room cleaned daily with a different towel animal on the bed each day. Lovely grounds with river running through. Trails to hike and tours organised both on and off site. Extremely nice staff, from check-in with Daniel to the bar and restaurant staff, and Diego, our nature guide. We thank Janet, and Sara, and a young gentleman at the bar and the restaurant, whose name I regrettably forget. I remember his mom lived on the other side of the lake. He always had a gracious smile, and eager to please. The grounds are amazing, the walk around is a must with all of the hidden waterfalls, and spectacular flowers, and plants. Happy hour was a great bonus, and the rolls served with dinner are to die for! Wish I had more time to explore.